“How to create a mini-MOOC” workshop was held at ALL DIGITAL Summit in Brussel on October 18th, 2018 by Bill Vassiliadis from DAISSY Research Group of Hellenic Open University .This workshop was supported by the BRIGHTS project. In this blogpost you can read about the workshop and check out the materials. Bill Vassiliadis is an Associate Professor at the Technical Educational Institute of Western Greece. He received his Engineering Diploma (in 1995) and his Ph.D. (in 2003, in Information Retrieval), both from the Department of Computer Engineering and Informatics, Univ. of Patras, Greece. Bill is a Project and Quality Manager of DAISSy (Dynamic Ambient Intelligent Sociotechnical Systems) Research Group at the Hellenic Open University. Since 1998, he has participated as a researcher in several EU and national R&D projects. His research interests in MOOCs include quality design and standardization issues. The aim of this workshop was to give participants an overview of the current MOOC (Massive Open Online Course) trends, design and development challenges and distance learning quality issues. Bill Vassiliadis gave an interactive presentation where open issues on MOOC design and development were discussed. Practical examples gave participants the opportunity to gain an in-depth view of problems and possible solutions. Target groups of this workshop included MOOC designers, HE policy makers and strategists, students and other learners in general, as well as teaching staff (teachers, facilitators). Furthermore, National Government and EU policy bodies, regional/national and international associations in the sectors of Education and Quality Assurance were targeted. 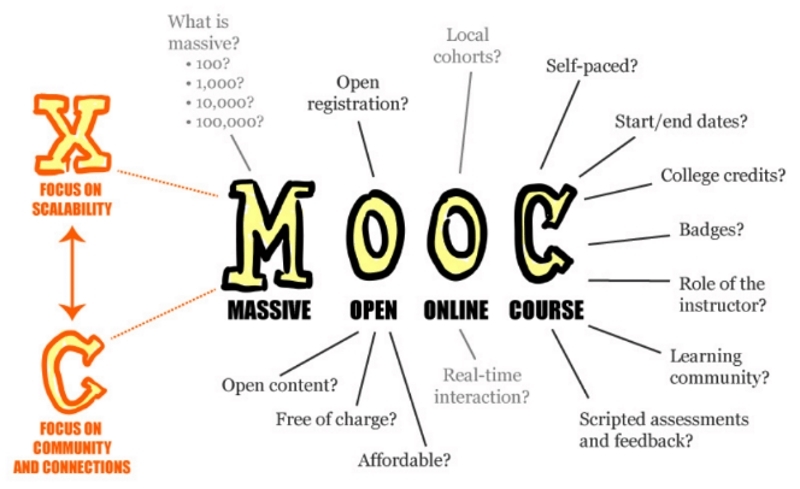 Why MOOCs and what’s different about them? Massive: very large number of (active) users with reduced interaction between tutor and learners. Open: free course, in some mixed models there is only a fee for getting the certificate/badge. Online Course: the course structure is usually weekly with extensive use of videos, automatic assessment and tools for group working and sharing. A mini-MOOC is a 2-4-week course and can be used for introducing basic topics (e.g. introduction to Social Inclusion) and/or for helping to take a decision (e.g. what bachelor degree should I choose?). It could be a shortened version of a full-scale MOOC. What are the pros and cons of MOOCs? Pros: free of charge; flexible; many course offerings/availability. Cons: no accreditation; they do not cover a topic in depth; flexibility which can be also a disadvantage because learners learn at their own pace; high drop-out rate (usually 60%); lack of interaction. 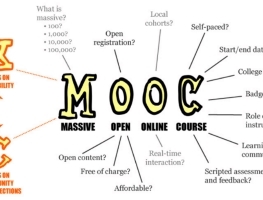 Pros: the MOOC hype and the re-use of open learning knowledge/resources. Cons: business model (usually free); hidden costs; difficult to change. 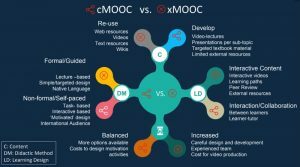 Mostly two different types of MOOCs can be differentiated: the cMOOCs, based on principles from connectivist pedagogy according to which the content should be aggregated rather than pre-selected and remixable; and the xMOOCs, based on a more traditional course structure. 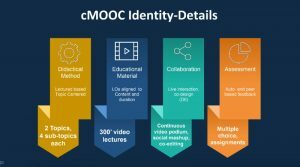 How can we make a successful MOOC? To have a successful MOOC, we should first choose a MOOC theme that interests a (large) target group and make sure that learners have something to gain, not just “knowledge”. How do you know the specific needs of your target group? You can run a pre-evaluation anonymous survey directly involving the target group before designing the MOOC. MOOC contents are extremely important: content quality makes the difference! Also, the curriculum should be carefully designed with progressive learning. Another important aspect to consider is the role of MOOC Tutors and Facilitators. The key factor is the motivation of the users to interact among them and create a community, hence the facilitation strategy is very important. Course duration and structure should be clear to the learners. Especially the week and the module structure are very important: goals, definition of key concepts, videos, additional resources, assignments, additional resources, etc. For each week, it is good to have a description of goals and skills stated using the Bloom taxonomy (learning outcomes). Content should have the minimum overload: lots of block available (too many are too confusing); clear indications on what to do next and clear signs on what a resource is (e.g. additional of core content). Course assessment should be fair and clear to the learners. How to identify an appropriate target group and its needs. How to allow for the widening of participation in education. This means, for instance, to provide opportunities for the learners to prepare and train for the learning environment and the methodology used. How to identify the right pedagogical design approach. How to identify the appropriate LMS solution depending on own needs. 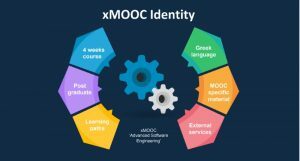 How to reach a consensus between cost and openness, flexibility and personalization (which the MOOC provides for allowing different learners to be able to build their own learning paths and to match them to their personal expectations and conditions. Participants in MOOCs are all there for different reasons and have different motivations). 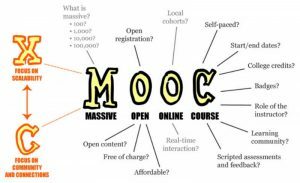 A good MOOC design is one which allows the replication of the services provided to an increasingly higher number of users for just a marginal cost. How to effectively develop effective educational material. How to design fair on-line assessment activities. How to attract and pre-register users. How to keep users interested during the course. How to handle drop-outs during the first week/module of the course. In this workshop participants learned about current MOOC trends, design and development challenges and distance learning quality issues. Hands-on activities guided participants through the various steps of MOOC-Analysis, MOOC-Design and MOOC-Implementation. The workshop was suitable for all levels of experience with e-learning. The range of case studies introduced helped participants see ways in which MOOCs and mini-MOOCs can be used in a range of contexts to promote learning and knowledge dissemination. Where to find more information online/ good online resources? This workshop was supported by the BRIGHTS project. The MOOC “Addressing Global Citizenship Education through Digital Storytelling” has been developed in the framework of the European project BRIGHTS, co-funded by the Erasmus+ Programme of the European Union. The MOOC contents and platform have been developed by Maks vzw, Guglielmo Marconi University and Hellenic Open University under the coordination of ALL DIGITAL from Belgium, and in collaboration with project partners Centre of Technical Culture Rijeka (CTC Rijeka), Centro Studi Foligno (CSF) and Hellenic Professionals Informatics Society (HePIS). The BRIGHTS MOOC was delivered in Belgium, Croatia, Greece and Italy. During this 4-week online course, trainees wgained a thorough understanding of how to design and apply the Story Circle Methodology to implement Global Citizenship Education (GCE) using Digital Storytelling (DS) technique with young people both in schools and in non-formal educational contexts. The MOOC responds to crucial training needs that are emerging among young people, such as intercultural and cross-cultural skills, critical thinking, collaborative and project-based learning, creativity and digital literacy. Course participants acquired the knowledge needed to meet the global challenges emerging in contemporary society, including sustainable development and lifestyle, social inclusion and cultural diversity, gender equality, peace and human rights, active citizenship and democracy, and learned how to engage young people in the production of digital stories on these challenges.